The new quadrupoles for the DAFNE collider interaction section are ready to be installed on the machine. These magnets will provide focusing the beams interacting in the vertical plane and are very important to enable e+e– colliders to reach high luminosities. To achieve this goal, quadrupoles must be able to produce high-intensity magnetic-field gradients, of the order of 29 T/m, and, at the same time, they must have very compact dimensions so as not to interfere with the experimental apparatus which will use the particles produced in the collisions. To accomplish this double objective, the quadrupoles have been constructed with a sophisticated technology based on the use of special materials on which it is possible to definitely impress a very specific magnetic field. DAFNE permanent magnets are made of a particular compound of rare earth elements made of a mixture of samarium and cobalt SMCO (2:17). The core of each defocusing quadrupole is composed of small blocks of permanent magnets which, as a whole, contribute to generate the magnetic field configuration necessary to produce the gradient required. The quadrupole supporting structure, instead, was built by machining an aluminum block with the electro-erosion method in order to ensure every single block is positioned with the accuracy of some cents of a millimeter. Permanent magnet quadrupoles were designed by researchers and technologists of the LNF Accelerator Division, in collaboration with the French colleagues working on the ESRF synchrotron light source in Grenoble. 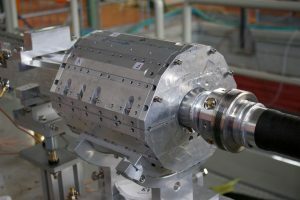 Precision mechanical components were built by firms operating in the Lazio Region, with the purpose of increasing the transfer of technological competences which is the cornerstone of the INFN third mission.